This week has just been so intense! With all the talk of debt dominating headlines from the U.S. and the euro zone, I feel like my brain has turned into an ice blended Frappuccino. As I mentioned in my post yesterday, EU officials announced their plan for bailing out Greece. Prior to that, we heard mixed reactions from policymakers with German Prime Minister Angela Merkel warning markets at one point not to keep their hopes up while other officials maintained their optimism for an agreement. A little while ago, I found out from Pip Diddy that the Europeans were able to set their differences aside and finalize the new 159 billion EUR package. In addition, the European Union leaders would also extend the debt maturities of Greece and offer loans with lower interest rates. That seemed to be enough to calm investors… for now. In the U.S., it seems like policymakers at Washington are still at odds about raising the debt ceiling. Basically, the market wrestled with these two major themes and they’re probably why my HLHB system didn’t generate any decent trade. A couple of signals materialized during the week but the first one turned out to be a loser. The succeeding candle following the crossover went below 30 pips of the low of the crossover candle and since Stochastic was only approaching the oversold area then, a sell order would’ve gotten triggered at 1.4021. Too bad that it was nothing more than just a fake out. EUR/USD bounced back up and the trade would have stopped out at 1.4146 when a new crossover materialized. Making it even worse for my HLHB, the second crossover, which could’ve been a winner, wasn’t a valid trade. 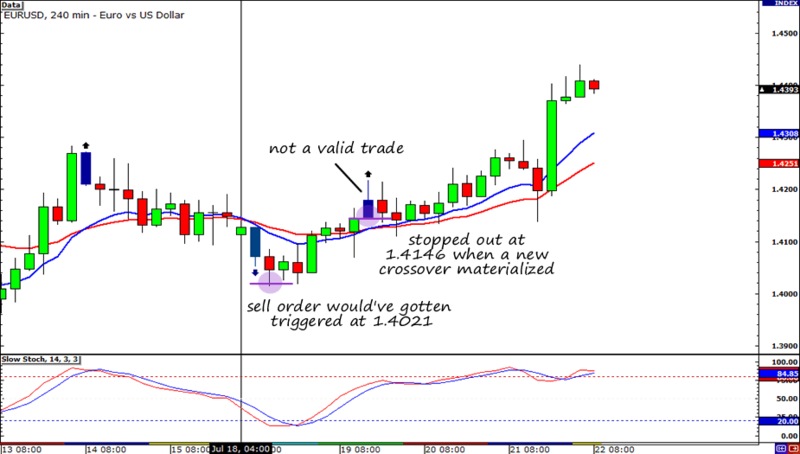 The candle following the crossover didn’t go over 30 pips of the crossover candle. Boo! I REALLY NEED TO MAKE CHANGES TO MY HLHB SYSTEM but, I can’t just fit it in my schedule. Once I get some free time (hopefully in next week or so), I’m going to work on my system and it optimize it. The market conditions have changed, and it just doesn’t work anymore. That’s it folks! Stay tuned for my updates next week!